The High Speed Laser Fax machine that means business. The Panafax UF-4500 is standalone laser fax machine, with the speed and feature set of a high volume device. 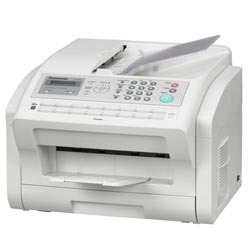 The High Speed 24PPM laser print engine prints your received documents at the fastest speed possible and the 4MB of standard fax memory ensures you never miss a fax, even if the device runs out of paper or toner. Perfect for any office enviroment which requires a dedicated fax device for receiving documents. This cost effective solution is designed to meet the needs of today's most demanding office.